Many Americans are familiar with the Gettysburg Address. You know, the Lincoln speech that begins “Four score and seven years ago…” But what many people don’t realize is the circumstances leading to that famous address. Sure, they’ll connect it to the Battle of Gettysburg, but perhaps they think Lincoln showed up and started talking the day after the battle. The situation which led to the Gettysburg Address was created by the battle. It is a somber topic. For the sake of my readers, I have chosen to go into graphic detail, but I feel it is important to take time to remember the sacrifices and what actually brought Lincoln to Gettysburg. The experts tell us writers to create problems, conflicts. Then, increase the drama and lead to a climatic moment of resolution. Contrary to popular belief, the Union Army did make a serious attempt to bury their fallen comrades. The Union battle lines were mostly defensive, so their dead were near or within their lines. Thus, each regiment buried their soldiers, making attempts to mark the graves with wooden headboards. The Confederate army had fought offensively (attacking) during Gettysburg. 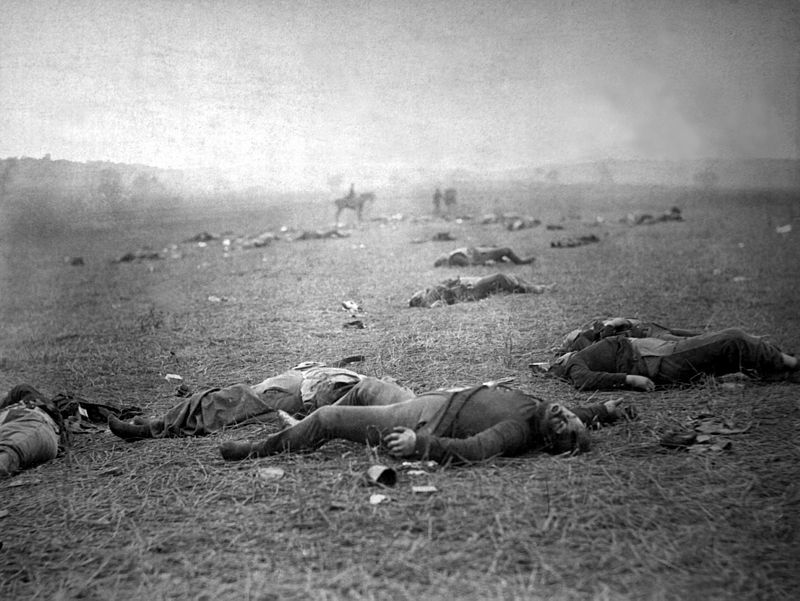 Their fallen were usually in open fields in front of the main Confederate positions. Therefore – to speak generally – the Confederates did not organize burial details. The Confederate dead were left in the fields. After the Union survivors had managed to clear the fields of the wounded and temporarily bury their own dead, they left the Gettysburg area. Civilian men from the Gettysburg community volunteered to help bury the fallen Confederates. Many were buried on local farms and the graves were simple recorded as “Confederate graves” – rarely including units or names of the deceased. 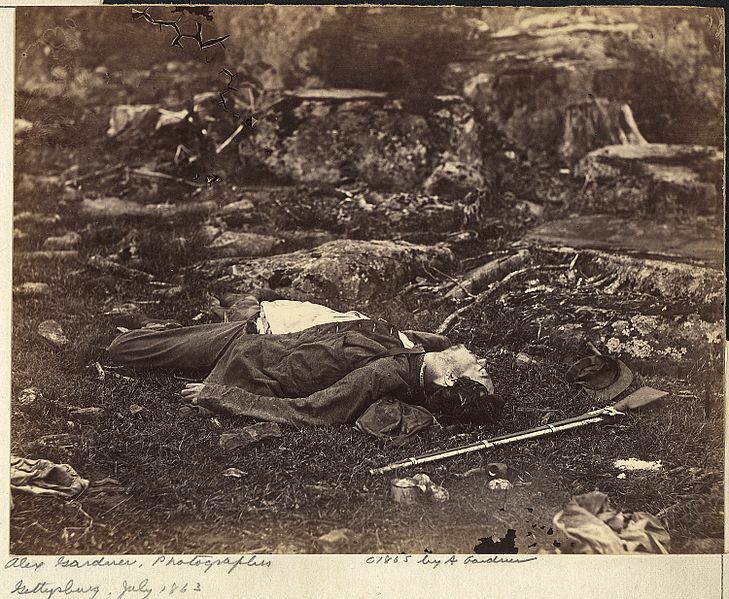 Although the Union army had made an effort to honor their dead, the burials had been hasty. The graves were shallow. The headboards were lightly carved or the information was written in pencil. Gettysburg experienced torrential rains in the week following the battle. While the rain helped to cleanse the landscape (and probably prevented an epidemic of illness), it also opened the shallow graves. Across the Gettysburg community, frightful and unsettling scenes appeared. Decomposing bodies uncovered by the streaming water. Skeletal limbs protruding from the ground. The civilians began the awful task of trying to rebury – or at least cover – the dead. The stench was horrible. Most civilians commented on the terrible odors in their writing. Some carried handkerchiefs sprinkled with peppermint oil and keep the cloths pressed to their faces whenever they went outside. In the weeks immediately following the battle, most civilians were focused on helping the wounded or repairing the damages to their property. And yet, the sights of the shallow graves and the horrible stench was a constant reminder of the loss and suffering. People realized something had to be done, but most were too busy to even begin thinking about a solution. However, one man hatched an idea that would solve the problem of the Gettysburg graves and would also bring honor to the fallen soldiers. Gettysburg had a serious problem. What could they do about the soldiers’ graves in their community? Was their a way to honor the dead, or would the graves be ploughed apart in the next spring’s planting? Great article! I didn’t know any of this. I love learning from you Sarah. Thanks. It’s great to hear that the information is helpful! Thanks for the article, Sarah. It’s good that you’ve found an unexpected aspect of the battle to highlight. Glad the article was of interest to you. It is such a sobering topic, but we must never forget the sacrifices that have been (and are) made to preserve our country.